Tara's Favorites: Whole Foods: $5 for a dozen Roses! 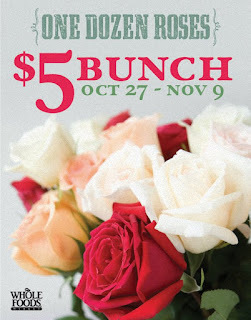 Whole Foods: $5 for a dozen Roses! This is not exactly a "needed" item. But, it's a great deal. Get a dozen roses for only $5 bucks! The sale is good October 27 - November 9. I know that the Franklin TN store is doing this, I'm not sure of the others. This site is great and just loaded with helpful info! I like flower very much. And it will be more wonderful if I can buy it with some discounts! And you can do that,too.